Here are the do-it-yourself home security systems that top SafeWise’s list for easy installation, customization, and superior service. For customers who’d like the security of a brand name system without the commitment of a contract, SimpliSafe offers an exceptional value and has some of the highest-rated equipment in the industry. 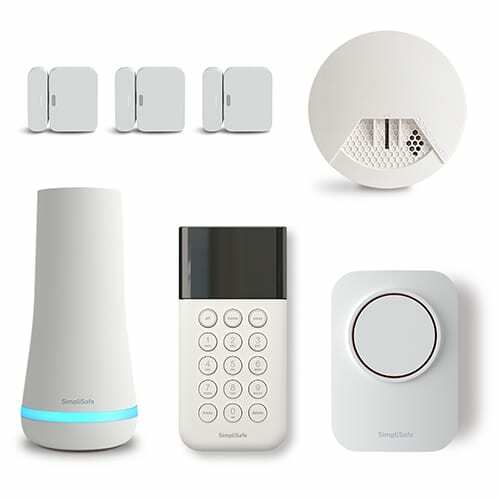 SimpliSafe’s starter kits earn glowing reviews, where customers report being highly satisfied with the quality of the equipment, ease of installation, and willingness of the company to step up and make it right when things go wrong. In fact, the company earns the highest Amazon customer ratings of any DIY security system on our list. While it’s not required, you’ll want to opt for the professional monitoring package that not only allows access to cellular backup and 24/7 professional response but also controls home automation remotely for a small additional monthly fee. This is the longest equipment warranty of any of the DIY systems without a contract, and it signals that SimpliSafe is more than willing to place trust in the quality of its equipment if you’ll do the same. Just be aware that the dated style of the white, plastic components may not blend seamlessly with your modern industrial décor. Unlike other do-it-yourself security systems with extended equipment warranties, SimpliSafe does not require contracts. So if you decide to opt for a professional monitoring package, you can reconsider that commitment each month. While professional monitoring is not required with SimpliSafe, we do recommend opting for the standard package with 24/7 monitoring service and cellular backup that ensures your wireless security system will remain on guard when the power goes down. Customers who want the comfort of professional monitoring combined with affordable equipment should consider investing in Frontpoint. An easy installation process and convenient wireless components are two of many advantages that make this industry leader one of SafeWise’s top recommendations in home security. Frontpoint sets the standard for customer service in wireless home security, earning stellar ratings from the Better Business Bureau (BBB) and kudos from industry experts. Its approach puts customers front and center, with service agents who take the time to consult rather than push product. Frontpoint also gets top marks for transparent pricing that avoids hidden fees and ensures customers get exactly what they’re paying for. Stick it and forget it with Frontpoint sensor and security components that are wireless and a breeze to install. Plug in your control panel, place the sensors within 100 feet of the panel using stick-and-peel tape, and activate the system. Customers report the entire process takes less than an hour and involves zero wiring or drilling, a bonus for renters. As with most things, you get what you pay for. While Frontpoint does require the additional cost of monitoring, you’ll reap the benefits from worry-free professional service accompanied by an extended three-year equipment warranty. It’s one of the key advantages of choosing a home security brand name with a great reputation for standing behind its products. Frontpoint absorbs a bit of the cost of professional monitoring by offering extremely affordable equipment. A starter kit comes in under $100, one of the least expensive options available on our list. While Frontpoint does require the commitment of a twelve-month contract, customers won’t have to invest heavily in up-front equipment costs to get a basic system in place. While Frontpoint monitoring is pricier than some other systems on this list, you’ll get what you pay for with fantastic service and the comfort of around-the-clock monitoring. The starter kit is a terrific value and especially attractive for new homeowners or apartment dwellers who might be strapped for cash up front. Cove is an economical, customizable home security system that delivers the basics and makes protecting your home super easy. But the new kid on the block is still proving itself, and Cove has some work to do when it comes to its mobile app and smart home compatibility. 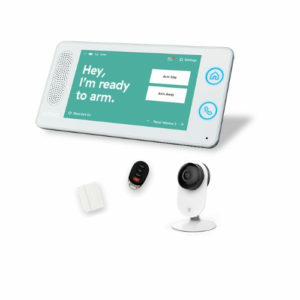 Cove is one of the most affordable home security choices you’ll find. One of the company’s core values is to be economical, and on that point Cove delivers. There aren’t any contract requirements, and monthly monitoring is pretty cheap, even if you opt for the higher-priced Value Plan. At $24.99 per month, that’s about the same as a weekly splurge at Starbucks—and for a lifetime warranty plus mobile access to your security system, we think it’s worth it. 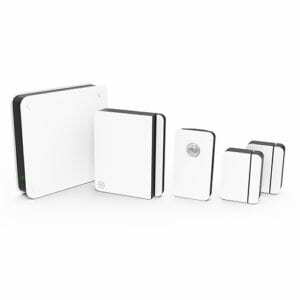 Link Interactive’s security system plays nice with a variety of Z-Wave home automation devices, so you can expand into smart lighting and thermostats without worrying about compatibility. Partnerships with 2GIG, SkyBell, and more allow customers to choose from a variety of home automation bells and whistles without sacrificing on security. The mobile app Link Interactive utilizes is from Alarm.com, which is the same mobile interface Frontpoint has. It earns top marks for user-friendly features and seamless home automation integration that allows you to remotely disarm and arm the system, control lights, open doors, and more. Link Interactive has one of the most affordable professional video monitoring plans. Access the live feed via the mobile app or let a professional handle it for just five dollars more a month. Cameras come equipped with options for night vision and HD to ensure you’ll get a clear picture of what’s happening in your home. 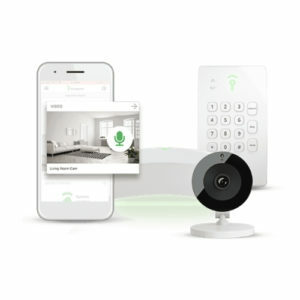 Both security and home automation devices from 2GIG, Link Interactive’s equipment partner, earn some pretty solid reviews on Amazon and from industry experts. Because Link Interactive devices focus on compatibility, customers get more flexibility for their buck and, despite up-front costs, greater long-term satisfaction with their system. If you’re searching for a DIY security system that provides all the bells and whistles, look no further than Link Interactive. In addition to a robust, highly rated equipment package, you’ll get the most economical video monitoring in the industry. Scout’s modern, sleek equipment is the backbone of a versatile security system that you can build out on your own. Pick a hub and add on however many panels and sensors your home requires. While the individual pieces of equipment might be more expensive than some of the budget options on our list, you’ll get the benefit of buying what you’ll actually use and the ability to add on components later. If you’re looking for a security system that’ll integrate seamlessly with your home automation gadgets, Scout should top your list. 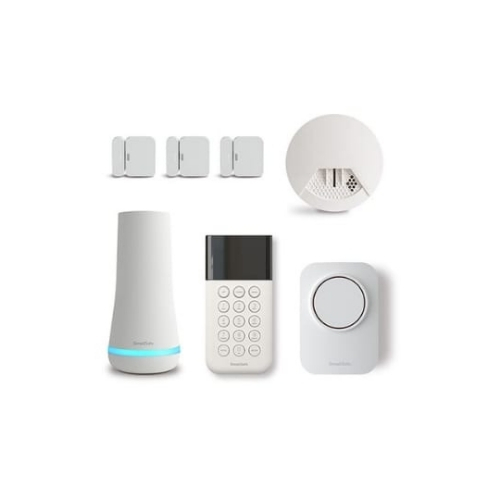 While its equipment line isn’t currently compatible with Z-Wave, you can use Scout to control your Samsung SmartThings, including lights, smart outlets, voice assistants, and more. Scout doesn’t have security cameras, thermostats, or smoke detectors just yet, but it is compatible with ecobee and NETGEAR products. While a monitoring package is required when you purchase equipment from Scout, you can go with a basic monthly package that’ll give you access to the mobile app and allow you to personally respond to notifications from the system. We do recommend eventually getting 24/7 professional monitoring, but you can start with the basics to ensure you like the system before you invest in more. You can go month to month with Scout and not worry about long-term contract or commitments. While you do need to pay a monthly ten-dollar fee for continued mobile app access and notification management, you won’t be locked in to a long-term contract. Renters will find this particularly attractive alongside the ease of Scout’s wireless installation. Out of all the wireless home security systems on our list, abode is probably the only one with a design that will make you giddy with appreciation. Streamlined and minimalistic, it’s going to fit right in to your modern home even if your wallet has a few objections. 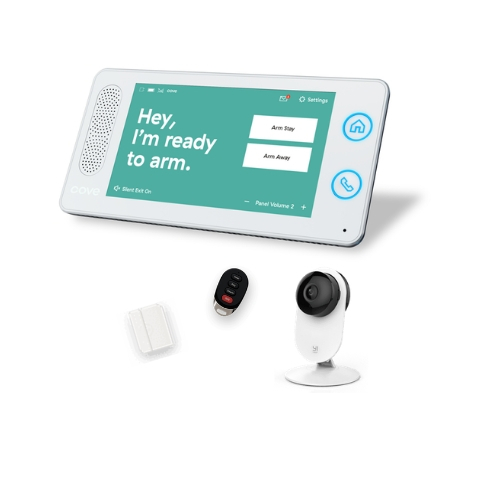 The abode starter kit is one of the few do-it-yourself home security systems that offers professional monitoring for short periods of time without contracts. While you can go month to month, customers can also choose three- or seven-day packages for smaller fees so you can step away from your home and your mobile device worry-free. The seamless integration and focus on compatibility are highly visible in abode’s mobile and desktop app, which earn the highest ratings from both Apple and Android users of all the DIY security systems on our list. While abode does have a special relationship with Nest devices, it’s versatile enough to work with both Z-Wave and ZigBee protocols as well as IP-connected home automation. Partnered with a user-friendly, superior mobile app, abode wins rave reviews from customers who have a complex web of IoT devices to manage. Piper is the ultimate in easy installation because it’s essentially an indoor security camera with some extra sensors. Simply plug it in, download the mobile app, and sync. This advanced camera interface works with all Z-Wave home automation devices, so it’s easy to tack on additional components and utilize Piper as a hub to manage a more complex security system. It’s one of the few systems on our list to work with both Alexa and Google Home. Because Piper focuses on indoor video monitoring as a method of security and surveillance, it makes sense that it offers additional storage. Most brand-name home security systems that have video monitoring usually charge a little extra for Cloud storage, but Piper gives it for free. While some other systems may have a plethora of sensors and a sprawling interface that utilizes a clunky, old-school keypad, Piper keeps it simple with a streamlined camera with a modern design that will blend in with your living room décor. While the equipment costs might be a little more initially, you’re paying for unparalleled flexibility. The list of manufacturers that provide devices for the Samsung hub is long and distinguished. This is also one of just two systems on our recommended list that works with Amazon Echo, Alexa, and Google Home products. Samsung SmartThings is a line that encompasses every manner of home automation, including smart appliances like fridges, washing machines, and more. Control lighting, thermostats, sprinklers, and door locks alongside your security system with plenty of flexibility for future innovation. A bevy of positive reviews on Amazon indicate Samsung’s system scores for compatibility and additional software available that easily expands the system to control other devices. The only complaints we could find appear to involve range and connectivity concerns. While iSmartAlarm doesn’t have a fully fleshed out home automation equipment line of its own, it’s compatible with ecobee, Nest, and many Amazon products like Alexa that you can integrate and manage through the mobile app. The low cost of starter packages like the one we recommended make iSmartAlarm one of the true bargains on our list, but beware that add-ons can get pricey, so it’s best to opt for a larger system now if you think you’ll eventually need more components. While it doesn’t earn dazzling reviews, the iSmartAlarm app turned in a solid performance on mobile for both iOS and Android devices. This is a problematic area for many home security companies, but it’s especially important for DIY users who might exclusively self-monitor using the mobile app. You have enough to worry about, which is why we focus on doing the research so you don’t have to. The SafeWise team digs through hundreds of customer and expert reviews, tests various products, and chats with sales reps and security companies to bring you the most informed recommendations available. Our customer service ratings are based on an average of Amazon reviews, industry expert ratings, and Better Business Bureau grades earned by the company. To pick the best DIY home security systems, we carefully considered various factors that are important to customers building and monitoring their own security systems, including ease of installation, affordable equipment, and professional monitoring options. We’ve carefully detailed both advantages and disadvantages of each system so you can make an informed choice for your household’s home security needs. To serve you up recommendations for a do-it-yourself home security system, we weighed the following considerations. While you may start out self-monitoring to save money, you could regret it as time goes on and your system grows increasingly complex. 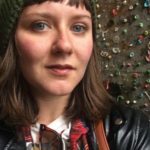 Opting for a company that offers some version of professional monitoring without commitment gives you the ability to add on services when you’re ready. One of the hallmarks of a true DIY system is its ability to communicate with and manage your other home automation devices. Without a flexible system, you’ll be locked in to what the manufacturer provides rather than the home automation you might prefer to install. Professionally monitored brands offer affordable equipment because they focus on recovering costs through long-term contracts and monthly monitoring plans. Once you choose DIY self-monitoring, you’ll need to keep a closer eye on higher equipment costs that could balloon past your budget. Renters and new homeowners might be reluctant to spring for a complicated home security system that they’ll just have to dismantle in a year, so many of our DIY choices have attractive alternatives with month-to-month monitoring that can be tailored to meet your needs. The brands on our unmonitored list do not require a professional monitoring package, although some do offer it for an additional cost. If you’d like, you can rely upon notifications from your mobile app or desktop for events triggered on your security system that require a response. This places the responsibility for notifying authorities squarely on your shoulders, however, and you may eventually find it’s too great a burden to bear. Some home security brands have a middle approach that either allows for month-to-month or intermittent professional monitoring. This approach gives you the convenience of worry-free monitoring for a brief window of time while you are away from home or traveling with the option to self-monitor when you return. At SafeWise, we always recommend professional monitoring as a best practice. It ensures that you won’t miss an important notification, and it allows authorities to be notified quickly during an incident, minimizing property loss and damage. That’s why, despite the hassle of a contract, our top three DIY home security systems include some version of professional monitoring. A secure, comfortable home at your fingertips. 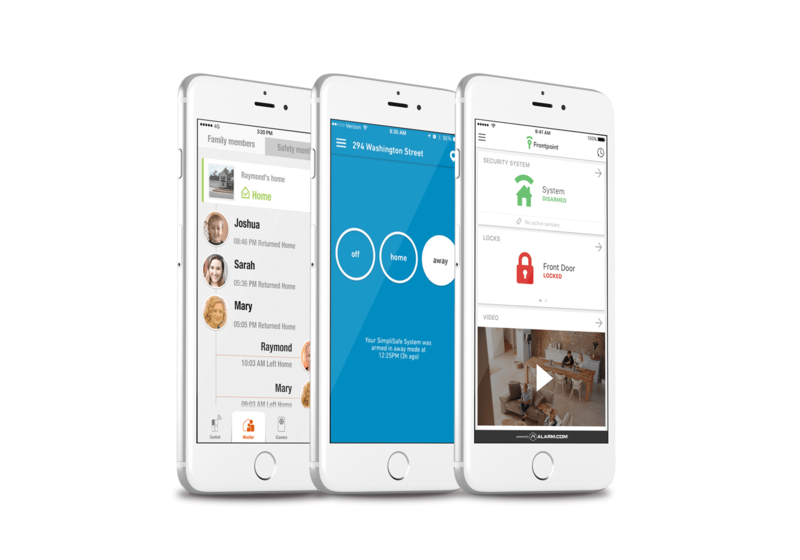 Mobile apps give homeowners not only control over the security of their homes but also the ability to self-monitor at a distance. 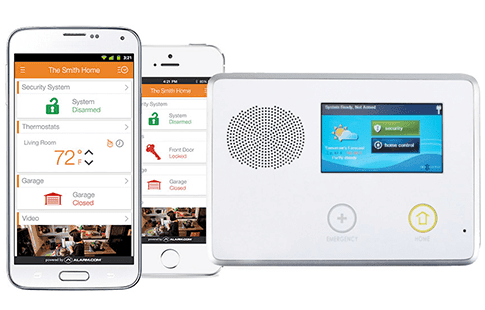 A user-friendly, well-functioning mobile app that maintains good connectivity with your wireless security system is a must-have for DIY installers who want to self-monitor. Optimally, you want to select a brand with a mobile app that provides not only home security monitoring but also a live video feed and additional home automation control. A flexible, easy-to-use app will offer homeowners the ability to add compatible devices as the Internet of Things becomes more advanced. When an alarm or sensor has been tripped, it’s vital to have eyes on the ground to determine the seriousness of the disturbance, especially if you are opting to self-monitor your security system. Indoor and outdoor security cameras can be invaluable tools in that effort, allowing homeowners to discern false alarms triggered by pets, verify the entryway hasn’t been breached, or get a good visual on an intruder. 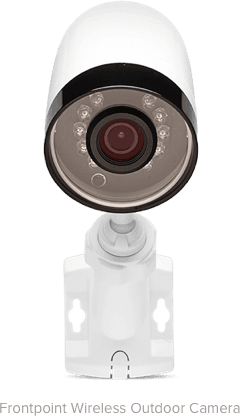 Some HD security cameras also have lots of extra features like 360-degree swivel, night vision, and more that can make these devices the backbone of a robust security system. Plus, it’d also be nice to know that package you’ve been waiting for arrived on the doorstep safe and sound, right? Check out our recommendations for the best home security cameras.